The Laguiole knife is a high-quality traditional French pocket-knife, originating in the town of Laguiolein Aveyron region of southern France. Thanks to their elegant and distinctive lines as well as fine craftsmanship and expensive materials, they have achieved the status of a design classic and are sold for high prices, sometimes several hundreds of dollars. The word Laguiole, pronounced “Lag-yoll”, is not a brand name it is the name of the village from which these knives originated. In the early 1900’s, production in the village ended and this is possibly because a number of unrelated companies in southern France had been producing the knives more efficiently in these industrialised centres taking business away from the knives traditional home. The city of Thiers, a long established centre of the cutlery industry was producing some 70% of all Laguiole knives from around the 1920’s. Local production of the knife in and around the town of Laguiole returned in the 1980’s. This was to the dismay of industrialized producers in other part of France as people wanted the ‘real thing’ a knife made in the actual village. So demand went back to the small manufacturer and away from the industrialised centres. Other manufacturers around France believe that a good Laguiole knife does not have to be made in the village but should be of French manufacture and be of decent or high quality to be authentic and discerning buyers should avoid any not made in France. It’s not real if it’s not made in France. The design dates from the early 19th century with a farmer’s knife from the village. According to legend, it was the Aveyron born Jaques Calmels, son of an innkeeper who invented the knife after an apprenticeship in cutlery production. The knife was first designed in 1829 and became the pattern for this style, the forged bee being its distinctive mark. There is some controversy and legends about the insect depicted on the catch. Some say it represents a fly or a horse-fly which would be familiar to peasants in the rural Laguiole area, which is known for cattle breeding. Others say the insect is a bee, an imperial symbol granted by Napoleon in recognition of the courage of local soldiers. In the year 1909 it was formally agreed on the bee. Classically there is a single blade, but sometimes a corkscrew or awl added. In 1840 the first awls appeared and were to help shepherds pierce the skin of sheep or cattle that had bloated from eating too much green grass. In 1880 they added a corkscrew in response to demands from waiters of the northern Aveyron. The shepherds’ cross is set in the middle of the handle and was used as a rosary. The knife was planted on the bread upright and thus shepherds who did not have the opportunity to attend church were able to say prayers. As Laguiole designates a type of knife and is not a brand or trade name, this style of knife can be manufactured globally. This has caused buyers to be weary of less expensive knives made in Asia. These knives are of much lesser quality than the handmade knives from traditional manufacturers in France. The knife is genuine if it is made in France and is made accurately in the style of a Laguiole. The village of Laguiole acquired its own forge in 1987 Forge de Laguiole and in 1991 the ‘Laguiole Origine Guarantie’ trademark was established that guaranteed that knives with this trademark could only be made within this specific geographic territory. the manufacturer of 99% of the Laguiole knives for the previous 80 years but demand shifted to knives made around the actual town of Laguiole. In response to the drop in demand, Thiers set up its own cutlers’ guild in 1991 known as the‘Confrerie du Coute de Tie’ . This is what gave rise to the Thiers knife, a prototype of which was duly registered. Each member of the guild can produce a Thiers knife within the concept of the design. Like ‘Laguiole Origine Guarantie’ the ‘Confrerie du Coute de Tie’ brand controls the quality, the territoriality and the concept of the knife design. Our knives are imported direct from manufacturers in both Laguiole and Thiers in France. They are both made with the same French authenticity of style and whether based on historic or geographic reasons, are truely authentic laguiole knives. With each knife you will receive a certificate of authenticity showing the name and address of the producer and all knives bear the logo of the French Knifemakers’ Federation, or a blade stamp of authentication. Branding of ‘Laguiole Origine Guarantie’& ‘Confrerie du Coute de Tie’. Most Knives are brand named and are sold on the good will of their long established manufacturing techniques. For example PUMA knives of Solingen in Germany have a long established reputation for high quality, so when you buy a Puma knife you know what you are getting. Because Laguiole and Thiers are places where knives have been made, these are not a brand name and several manufacturers can market their knives under these names. Over many years the great majority of Laguiole knives were made in the town of Thiers. With the reintroduction of a forge in Laguiole, the organisation of ‘Le Couteau de Laguiole’ registered the trademark ‘Laguiole Origine Garantie’. This was in conjunction with the resumption of the manufacture of Laguiole knives in the town of Laguiole. This trademark was a clever marketing move as it tied the name of the knife ‘laguiole’, back to the town of its original manufacture in Laguiole. Many buyers insisted that to be a true Laguiole it should be made in Laguiole and the logo of the Laguiole Origine Garantie ensured their authenticity. 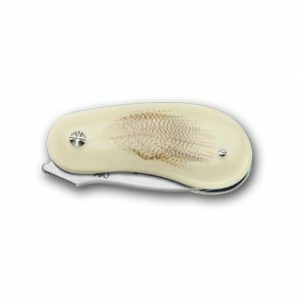 Laguiole Origine Garantie symbol embossed on the heel of the blade. Manufacturers in Thiers were somewhat resentful because they had been the major maker of the Laguiole knife for most of its history and suddenly the greatest demand shifted to those knives made only in Laguiole. The organisation ‘Confrerie du Coute de Tie’ in Thiers worked to develop a new concept for an alternative to the laguiole style knife. The fruit of the combined expertise of an entire profession resulted in the, “Le THIERS ®” knife, which is named after the eponymous town, the French capital of the cutlery industry, Thiers. I was only natural that they called this knife ‘The Thiers’ or ‘Le Thiers’ and manufacturers were now able to offer an elegant alternative to the ‘Laguiole’. The ‘Le Thiers’ is an outstanding knife that represents a distillation of the ancestral know-how of a long-standing cutlery tradition. To ensure that they also could guarantee that a Le Thiers knife met specific quality and design standards and was indeed made in Thiers, their trade mark was created to ensure its authenticity. Manufacture is governed by the rules of a Master-ship modelled on those of the 1582 Master-ship, which regulated the cutlery crafts of Thiers for nearly three hundred years. Master Inspectors are authorised to monitor compliance with Master-ship rules at each step of knife manufacture. This is why “Le THIERS ®” is a knife with a guaranteed badge of quality: moreover, this trade mark has been definitively stamped into the metal of the Trade Marks and Registration Numbers Sheets for future generations. The T. symbol embossed on the heel of the blade. These symbols are a guarantee that the knife you have purchased meets the stringent manufacturing guidelines to ensure such a high quality product. 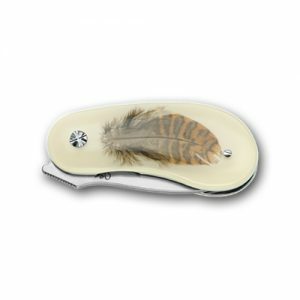 IS AN AUTHENTIC FRENCH LAGUIOLE/LE THIERS.